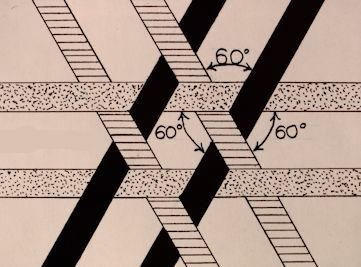 Conventional weaves employ two directions of yarn intersecting at 90 degree angles. Triaxial weaves are characterized by three directions (triaxial) of yarn intersecting at 60 degree angles. I had long been interested in the work of R. Buckminster Fuller. This interest jumped to a new level with the publication of Fuller's Synergetics: Explorations in the Geometry of Thinking in 1976, followed by Synergetics 2 in 1979. Reading these books inspired me to search for a way of incorporating Fuller's principles into my work. Two geometric relationships are at the core of his work: the tetrahedron (triangular pyramid) and the 60 degree relationship among elements. The early efforts focused on the tetrahedron which, naturally, led to off-loom sculptural works such as Twelve Degrees of Freedom and a number of somewhat less than succesful studies. In 1981 I shifted my focus to the 60 degree relationship and, in one of those delightful flashes of insight, conceived of three directional weaving and a means for doing it. It wasn't long before I discovered, as is usually the case, that if I've thought of it, someone else already has. This led me to resources on industrial triaxial weaving (I took the term "triaxial" from these sources). Several years of work and research led to the on-loom triaxial braiding technique. In 1984, I was invited to participate in the Conference of Complex Weaves held at the University of Manitoba in Winnipeg, Canada. This led to the publication of three technical articles in the journal Ars Textrina. They are included here as pdf files. For anyone so inclined, the articles show in detail different triaxial weave structures and include instructions on how to do the work. Due diligence: I made a serious effort to find out who owns the copyright of these articles. The publisher no longer exists, searches of the Canadian and United States copyright databases retrieved no results, and the editor associated with these articles could not be located. If you hold the copyright and prefer that these articles not be available online, please contact me. Works incorporating triaxial weaves are listed, with some images, on the Old Works page, mainly under Triaxial woven and braided works. 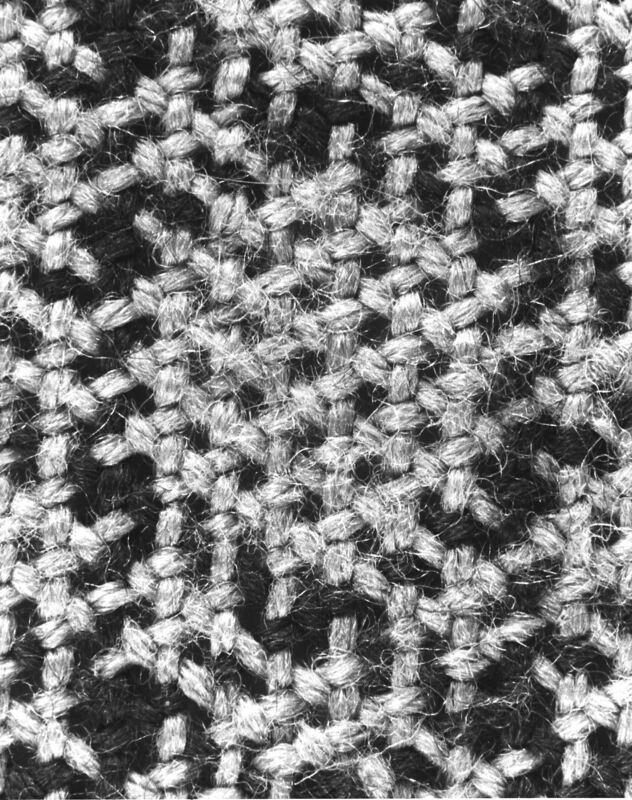 Works combining triaxial weaves with other techniques are listed in the Blended techniques section. These images are from two samplers of triaxial weaves. The variation numbers correspond to those described in the 1984 Ars Textrina article. "Opaque melodies that would bug most people."